The new Opel Astra OPC, a sport coupe, which was introduced at the Geneva Auto Show at the beginning of March 2012, has a seat pan made from a thermoplastic laminate with continuous fiber reinforcement (an “organo sheet”). 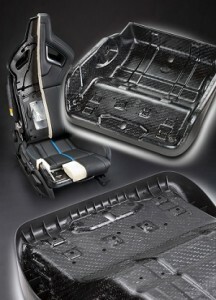 This is the world’s first auto seat pan based on this technology manufactured for a production vehicle. The seat pan uses a specialty polyamide from BASF’s Ultramid product range and is 45% lighter than its predecessor. Thermoplastic laminates with continuous fiber reinforcement, also called composites, are processed from plastic-impregnated fabrics. They serve as the reinforcement in plastic parts that must be especially lightweight yet still exhibit exceptional performance. BASF (Ludwighshafen, Germany) developed two special Ultramid grades for the Opel Astra OPC seat pan: an unreinforced grade that acts as the material in which the glass fiber fabric is embedded, and an impact-modified, short glass fiber-reinforced Ultramid that is used as the overmolding material to achieve the necessary ribs and edges of the part by means of conventional injection molding. Thanks to the high strength of the laminate, the wall thicknesses can be reduced considerably, allowing the weight of the seat pan to be lowered significantly. After the seat pan in the Opel Insignia OPC was first made from Ultramid in 2008, albeit still without laminate reinforcement, technological cooperation between the two companies went a step further. To design and build the seat pan for the Astra OPC, BASF engineers further provided material descriptions for the virtual design of both the continuous fiber-reinforced laminate and the overmolded ribbed areas of the part. The knowledge gained from this experience will be incorporated into an extension of BASF’s Ultrasim universal simulation tool, making it possible to predict the behavior of thermoplastic composite parts with continuous fiber reinforcement. The composite seat pan is produced by means of in-mold forming: this involves placing the heated and formable, thermoplastic laminate in the injection tool, forming it into the necessary shape, fixing it cleverly, and immediately overmolding it. BASF was able to support its customer with its own expertise in this innovative manufacturing process.